When Brigitte McQueen Shew, the founder of the Union for Contemporary Art in Omaha, came out to greet me last September for an interview, she was toting her beautiful, bright-eyed seven-month-old daughter. This was my first indication that Shew did things a little differently. Delightfully differently. Shew is the mastermind behind the Union, an innovative nonprofit that works at the intersection of art and social justice in north Omaha, a predominantly African American neighborhood. I was there to write about the Union’s brand-new building, a creative renovation of three historic structures into one dazzling space. It now has a museum-caliber gallery, pottery studio, fiber-arts studio, state-of-the-art print shop, an incredible black-box theater that produces works by playwrights of color, and a youth program that serves local zip codes. The idea is that the arts can be a conduit for social justice and community-building and that everyone should have access to these means of expression. Plus: plenty of financial assistance so EVERYBODY can participate. The fact that it is in a beloved historic building, where 1920s jazz musicians once played and the city’s first African American dentist practiced, makes it feel that much more connected to the community. I was most impressed by Shew herself, who led the organization in an unusually mindful, collaborative, HUMAN way. Everyone is allowed to bring their kids with them to work, for example, provided that they can still get their job done. The result is that the whole building felt like a hive of creativity and compassion. In other words, natural human habitat. 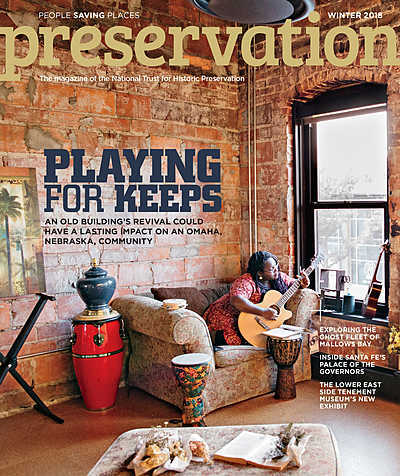 My story about the non-profit and the unusual building appears in the winter issue of Preservation magazine.